As per news circulated through out web, news paper and tv, third party/ contract manufacturing is going to be banned. But we are not sure about source of these news and whether these are true or not. If these are true, then it will not be beneficial for pharmaceutical sector. A large number of manufacturing units and thousands of marketing companies have shut down. This will be great loss to pharmaceutical sector and ultimately medicines will be costlier due to monopoly of few pharmaceutical countries. We received queries in this regard from many readers, so we decide to analysis few facts about these news. We will try to find out whether these romours are true or false. Here we are going to discuss about fact which will be change for third party or contract manufacturing. We don’t think, third party or/and contract manufacturing is going to be banned because it is legal phenomena and helpful in growth & new business possibilities. If we study today’s big player in pharmaceutical sector, they started as marketing company. Later they established or overtake manufacturing units. Establishing Marketing Company is much easier than to start a manufacturing unit. 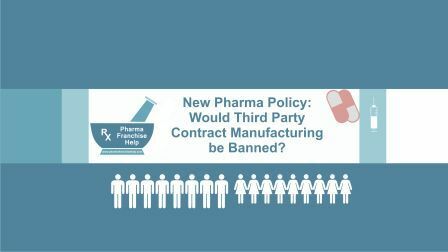 If government bans third party/contract manufacturing, then it will effect adversely at pharmaceutical sector growth and will increase unemployment. In 2006, Draft National Pharmaceutical Policy, Heading Control on Pharmaceutical brands describe a very serious issue. This is what that should have resolved many years ago. This issue was related to brand name resemblance and same brand name for different preparations. For example, We have a Brand Name Cef for an active ingredient Cefixime and another company is using Cef for an active ingredient Cefpodoxime. Same brand name is using for different active ingredients. Read Related: What would be Trade Margin if government fix margin for Pharmaceutical Products? Few years back, manufacturing companies got approval with Brand Name, Generic Name and Marketed by companies Name from state drug department which was not a desirable practice when marketing is done at the national level. State authorities wasn’t check for brand name already approved/applied within state and/or approved/applied in other states. So, these types of approvals were stopped and approval from generic names were started to manufacturing companies. Once a generic approval was given to a manufacturing company, it was allowed to manufacture any number of brands with single generic approval. It worsen the condition because drug authorities don’t have any control of manufacturing from Brand Names. As per our analysis, it would be compulsory to take brand approval from central drug regulatory by manufacturing or/and marketing company before launching a new product in market other than generic approval by state authorities. Without that no marketing or/and manufacturing company shouldn’t market a product in Indian market. Brand name approval should be compulsory from central drug regulatory whether a manufacturing company has generic approval from state authorities. It will helpful in controlling brand name conflicts as all approvals will be made from single authorities and all records will be maintained. Banning of third party or/and contract manufacturing is not a solution. One another hot issue of new drug policy is related to labeling of single active ingredient preparations. It is suggested that all single salt preparations should have only generic name, not brand name. Many developing countries have adopted this label pattern along with many developed countries. In India if this implements, it should be welcomed by pharmaceutical industry. If that happens, A single active ingredient will be like a classical preparation in ayurvedic medicines. A well known Ayurvedic Classical Preparation “Ashokarishta”. We find only company logo like Dabar, Zandu, Elzac etc and Name will be same as Ashokarishta. Likewise only Logo in single pharmaceutical active ingredient preparation would be allowed and salt name will be same below logo.